In large bowl, beat cake mix, butter, eggs and food color with electric mixer on medium speed until well combined (batter will be very thick). Using 1-inch cookie scoop, drop dough about 2 inches apart onto cookie sheets. Bake 10 to 12 minutes or until set. Remove from cookie sheets to cooling racks; cool completely, about 15 minutes. 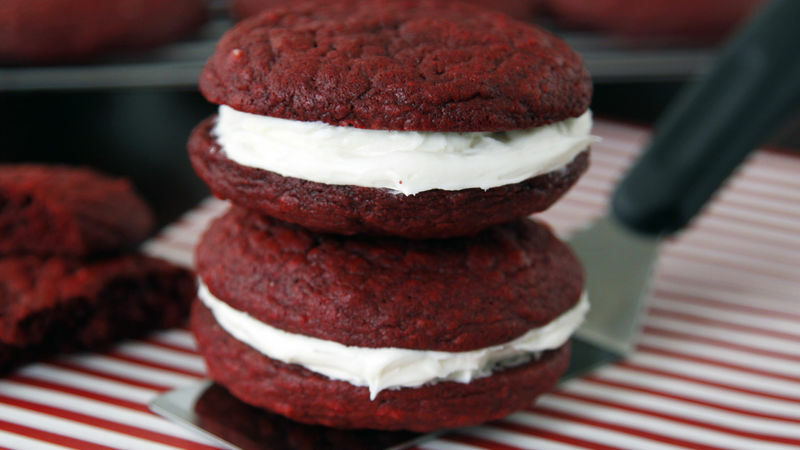 For each whoopie pie, spread desired amount of cream cheese frosting on bottom of 1 cookie. Top with second cookie, bottom side down; gently press together. For an extra-special touch, roll sides of finished whoopie pies in sprinkles of your choice.